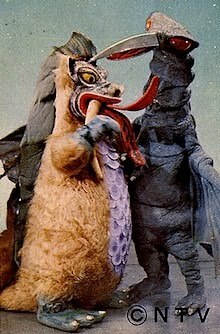 WISHING ALL OF YOU A HAPPY KAIJU NEW YEAR! From the January 28, 1967 issue of Weekly Shonen Sunday magazine. The Prolific Shiro Sagisu Picks Up the Baton! Recent portrait of GODZILLA RESURGENCE composer, Shiro Sagisu. The selection of well-known arranger, composer, and music producer, Shiro Sagisu, to create the soundtrack for Toho's upcoming GODZILLA RESURGENCE, written and directed by mavericks Hideaki Anno and Shinji Higuchi, may well be the least shocking aspect of this highly-debated film. Because Sagisu has a deep connection with the Big G, which goes back before he was born. 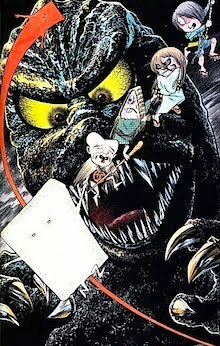 Unfortunately, the vast majority of Godzilla fans outside of Japan are either completely unfamiliar with Sagisu, or only know the composer from his scores for Anno's on-going NEON GENESIS EVANGELION series and movies or Shinji Higuchi's recent pair of live action ATTACK ON TITAN films. But, Sagisu's life has been filled with kaiju — more than anyone may have ever guessed. Sagisu's first single from his debut album, "Eyes", released in 1978. 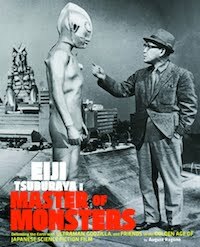 His father was a close friend and comrade of the master of Japanese visual effects, Eiji Tsuburaya: Tomio Sagisu (who also created manga under the pen-name Shoji Ushio). 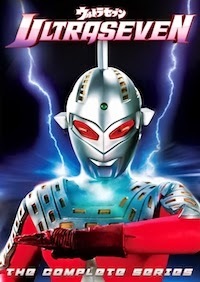 A member of Tsuburaya's effects crew, the elder Sagisu worked on numerous films at Toho (largely uncredited), until he founded his own company in the early 1960s, known as P-Productions. 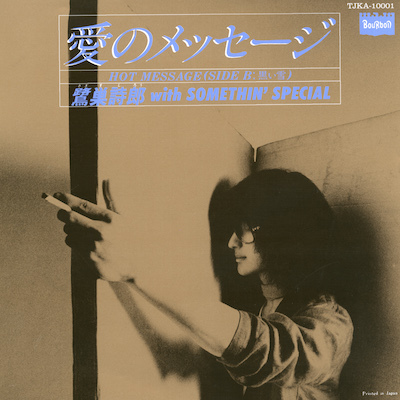 "Summer-colored Diary" (1983) arranged by Sagisu for Chiemi Hori. 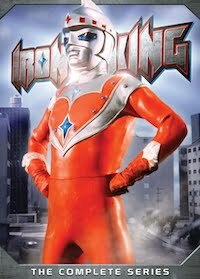 The elder Sagisu's company produced visual effects and animation for a number of movie studios and television networks, and pioneered their own productions, such as AMBASSADOR MAGMA (shown in the US as THE SPACE GIANTS), SPECTREMAN, LION MARU, DENJIN ZABOGA, to name a few. Today, in addition to being a composer, the young Sagisu is the President of his father's company. Sagisu has arranged for contemporary artists such as May'n (2011). 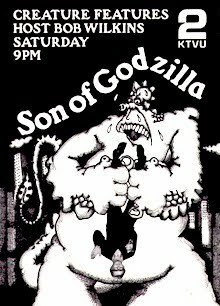 Born on August 8, 1957, Sagisu cut his teeth working for his father's company, and was soon put in charge of directing, writing, music and sound effects for live "monster shows" to promote the P-Productions brands in the mid-1970s. 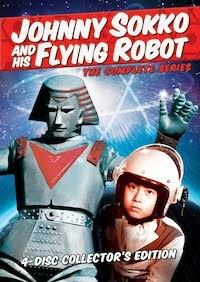 He also collaborated with his father in the production of a pilot film, which was never picked up, for a proposed sci-fi film/series entitled SILVER JAGUAR in 1980. 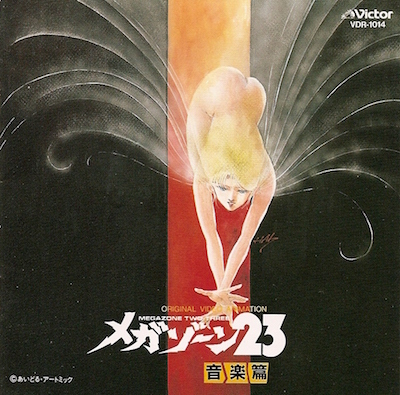 Shiro Sagisu's Original Soundtrack for MEGAZONE 23 (1985). The young Sagisu broke out on his own varied and wide-ranging music career in 1978, including his own instrumental releases, composing and arranging songs for some of the more successful Idol Singers, starting in the early 1980s, as well as more popular vocalists, with nearly a hundred successful collaborations over the years. 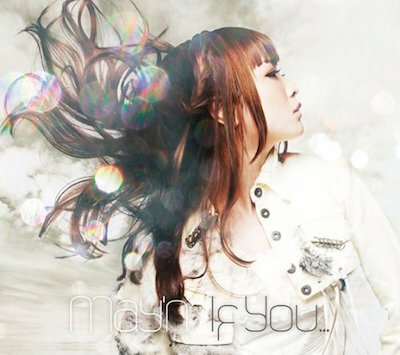 Sagisu has also racked up scores of soundtracks for films and television shows. 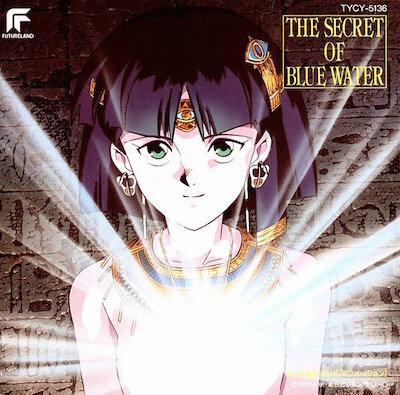 First Soundtrack to NADIA, THE SECRET OF THE BLUE WATER (1990). 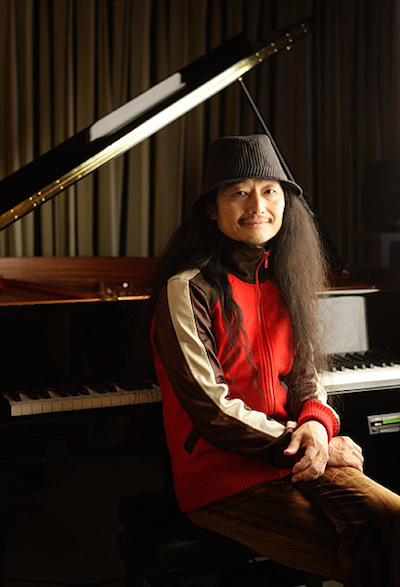 Some of his more notable television themes and scores include GOOD LAUGHS, MY FRIEND (1982-14), SAKICHI, THE FALLING STAR (1984), KIMAGURE ORANGE ROAD (1986-87), NADIA: THE SECRET OF THE BLUE WATER (1990-91), MACROSS II: LOVERS AGAIN (1992), NEON GENESIS EVANGELION (1995-96), HIS AND HER CIRCUMSTANCES (1998), BLEACH (2004-12), and MAGI: THE LABYRINTH OF MAGIC (2012-14). 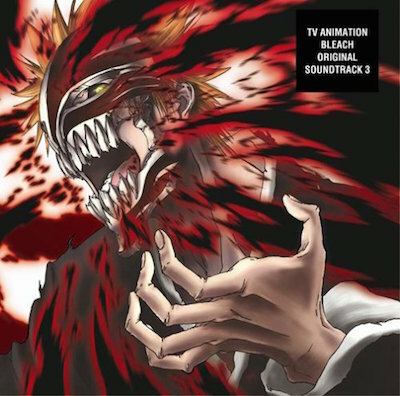 Third volume in the Original Soundtrack series for BLEACH (2006). 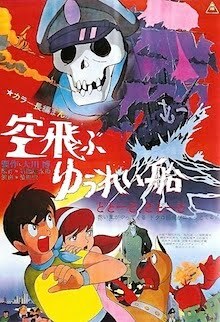 Sagisu's feature credits are Noboru Ishiguro's MEGAZONE 23 (1985-89), Kunihiko Yuyama's LEDA: FANTASTIC ADVENTURE OF YOHKO (1985), Yoshiyuki Tomino's GARZEY'S WING (1996), Kim Sung-su's MUSA (2001), Kazuaki Kiriya's CASSHERN (2004), Jo-Dong Oh's THE RESTLESS (2006), Noriyuki Abe's BLEACH (2006-10), and Toshiyuki Kubooka's BERSERK: THE GOLDEN AGE ARC (2012-14). 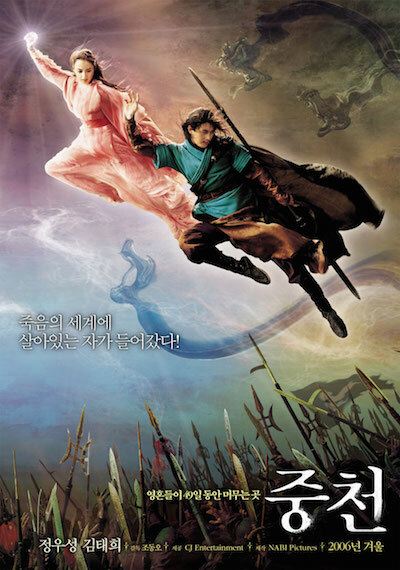 Poster for the South Korean fantasy film, THE RESTLESS (2006). With more than 37 years of experience with mountains of credits to his name — and as a fan of his earlier soundtracks (such as NADIA, EVA and CASSHERN), it will be interesting to see what Sagisu will bring to the kaiju eiga canon with his music for GODZILLA RESURGENCE, which opens nationwide in Japan on July 29, 2016. THE "GODZILLA RESURGENCE" ENGLISH POSTER! English Poster unveiled on Toho's official Shin Godzilla website. 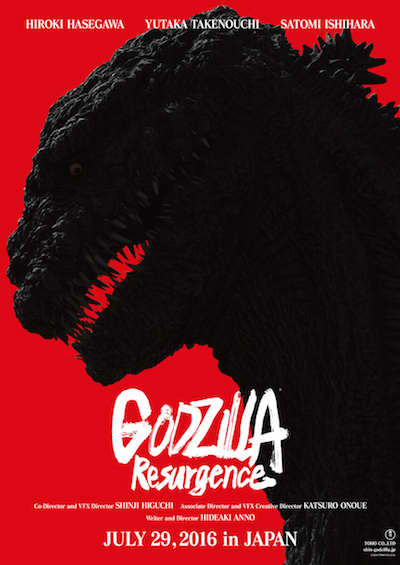 Toho's official SHIN GODZILLA website, dedicated to the film, being marketed to countries outside of Japan as GODZILLA RESURGENCE, just a day after the reveal of the teaser poster and trailer to the press, was updated with those, as well as the international English-language poster, featuring the names of the main cast and the three principal filmmakers bringing the monster back to cinematic life. 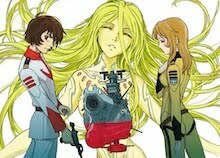 No surprise are writer-director Hideaki Anno and co-director/visual effects director Shinji Higuchi, as well as associate director/visual effects creative director Katsuro Onoue. A veteran of Toei Studios, Onoue has a lengthy list of credits, including work with Higuchi (Attack On Titan) and Anno (Evangelion 3.0), as well as visual effects under Kenji Suzuki on GODZILLA 2000 (1999). Stay tuned for more information on GODZILLA RESURGENCE as it develops! 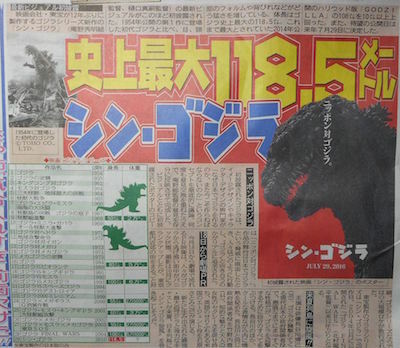 December 9, 2015: "Japanese Press Reveals Shin Godzilla's Size"
December 9, 2015: "Scoop! Teaser for "Godzilla Resurgence"
This Will Be the Biggest Big G of Them All! Today, Chunichi Sports revealed the new Big G's measurements! Today has been a flurry of reports on the upcoming film GODZILLA RESURGENCE, including the reveal of the monster, the first teaser trailer, and now, according to Chunichi Sports, the specs on the new Big G's size! According to the headline of this article, the new King of the Monsters will stand (?) a whopping 118.5 meters tall — that's just under 389 feet! In comparison, the Legendary Pictures iteration stands 108.2 meters (355 feet). 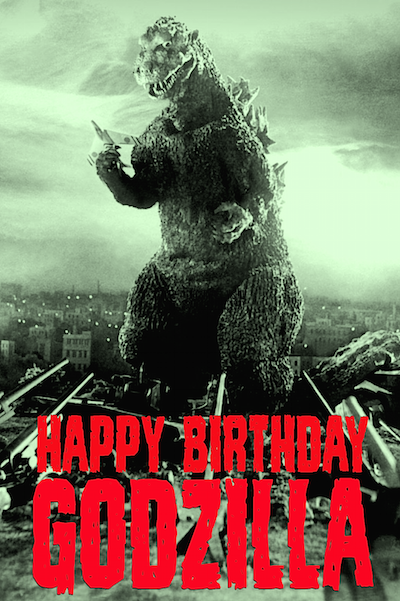 Not much, but it's still Godzilla. Special thanks to Takao Yoshiba for the image and stay tuned to this blog for more information on GODZILLA RESURGENCE as it develops! SCOOP! TEASER FOR "GODZILLA RESURGENCE"
Cinema Today Posts The First Teaser Trailer! Now, here's the "announcement" trailer for GODZILLA RESURGENCE! While this very first teaser doesn't reveal much, except some B-Roll panic scenes, a new credit attached to the film comes up during on of the intertitles: Katsuro Onoue as "Associate Director/Visual Effects Creative Director." 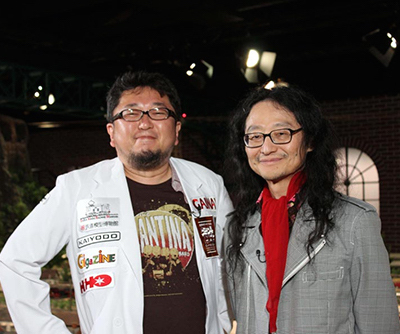 A veteran of Toei Studio's Visual Effects Laboratory, Onoue has a lengthy list of credits, including work with Higuchi (Attack On Titan) and Anno (Evangelion 3.0), as well as working with Kenji Suzuki on GODZILLA 2000 (1999). 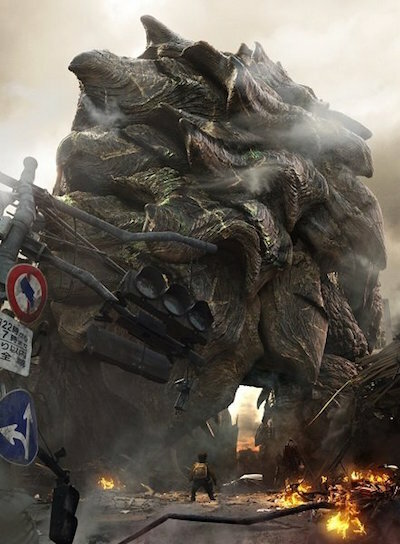 HERE'S YOUR BIG G IN "GODZILLA RESURGENCE"
Image Reveals the "Greatest, Worst Nightmare"! 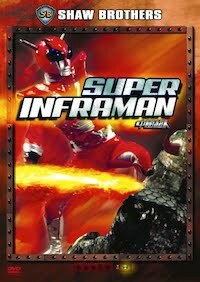 Public unveiling of the new Big G with tagline "Japan vs. Godzilla". 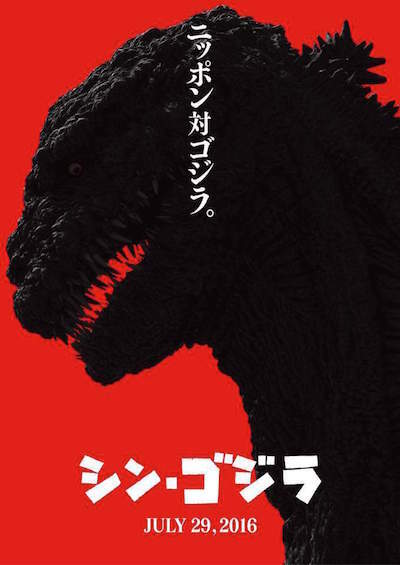 On December 9th (Japan Time), the first image of the titular monster for the highly anticipated collaboration from directors Hideaki Anno (Evangelion) and Shinji Higuchi (Attack On Titan) to be featured in GODZILLA RESURGENCE (Shin Gojira) with the Japanese release date of July 29, 2016. While this image has not appeared on any of Toho's official sites, this "nightmare" version of the Big G was revealed to celebrated American Godzilla artists, Bob Eggleton (Famous Monsters) and Matt Frank (IDW's Godzilla), as well as myself, just recently. 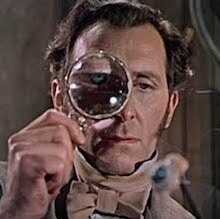 Additionally, journalist Norman England, who worked on a number of the films as a set photographer, also confirmed it's authenticity: "It's the real deal, all right. 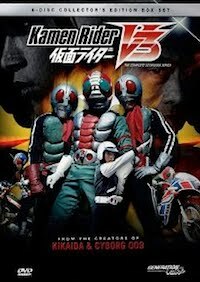 I was able to handle the suit when I was working on a project over at Toho a little over a month ago." In my mind, it does look like the work of noted designers, Mahiro Maeda and Takayuki Takeya, whom I profiled as the rumored artist and sculptor, back on August 1st — imparted to me from sources close to the production (see link, below). What do I think of this design? 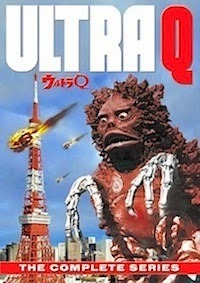 First off, it looks like one of the early maquettes sculpted by Teizo Toshimitsu for the 1954 film. Ultimately, I will reserve any final judgements until there's more to work with. 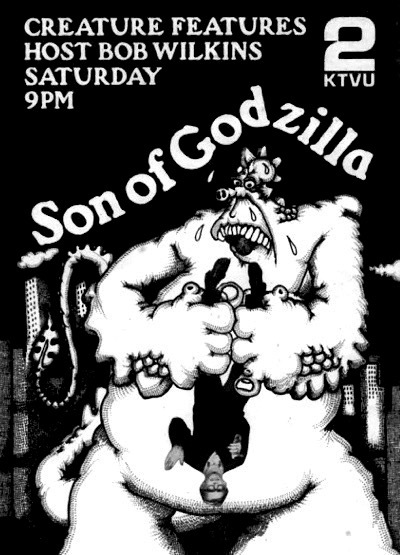 Although, I have to say that a departure from the norm — but still retaining the basic Godzilla elements — is welcome. Now, with visual effects rendering and compositing underway, it's only a matter of time before more images are forthcoming from the new film. Stay tuned to this blog for more details as they develop! Don't hate him because he's beautiful! The "Big G" has turned 61! "Yes, Even You... Can Commit Murder!" 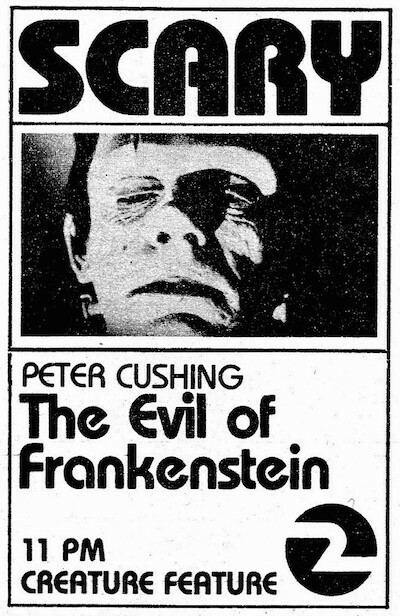 TV Guide ad for the Halloween broadcast on October 30, 1971. Big "Creature Features" Show on October 25th! 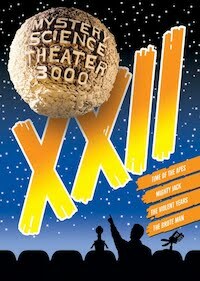 Event poster for this weekend's show at the Niles Silent Theater! 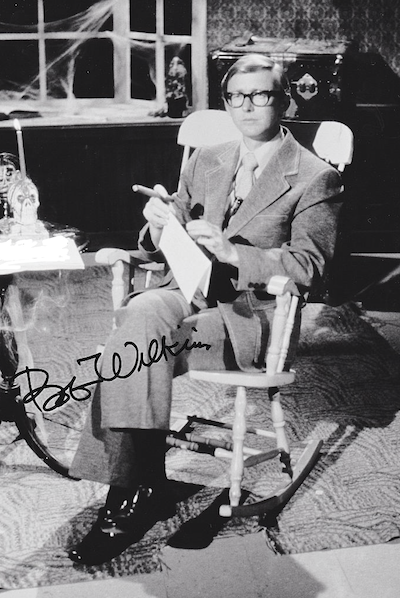 Join us for another rare, “complete” Bob Wilkins show, this time it's from 1976, with original host segments, TV commercials, and feature film on the big screen! 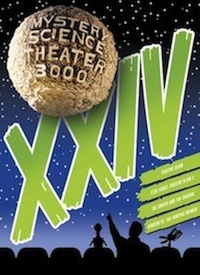 Included is our "Creature Features" raffle and items for sale. 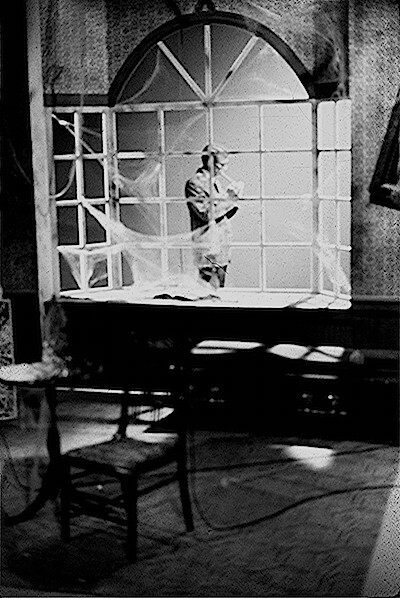 On hand to host the show is filmmaker and "Creature Features" archivist, Tom Wyrsch. Special surprise guests will be on hand. Don’t miss it! 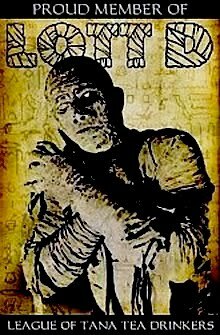 "We've Got a Classic and a Crummy Mummy." 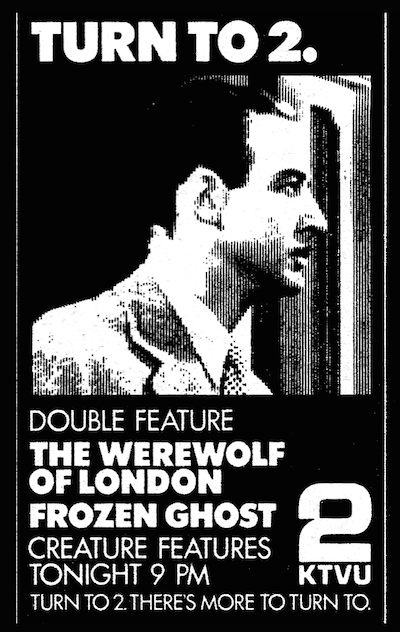 TV Guide ad for the October 2, 1971 double-feature broadcast. "Ah, Now Cut That Out!" Bob in South Lake Tahoe, while interviewing Jack Benny, circa 1966. 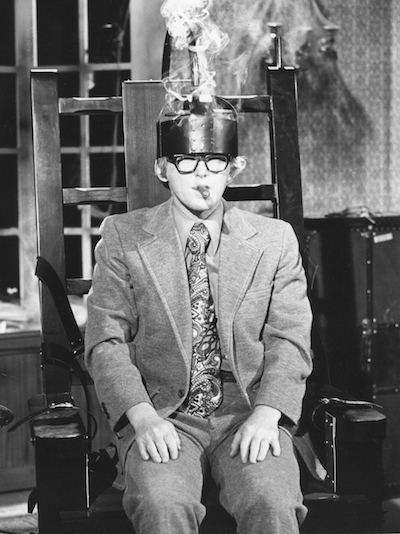 One of many gag Blackout Slides shown during commercial breaks. "Isn't Hyde a Lover After Your Own Heart?" 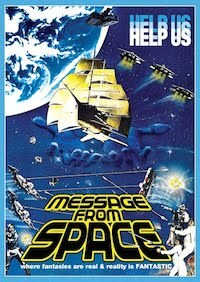 Invitation to MGM re-release of the 1931 version on June 14, 1972. 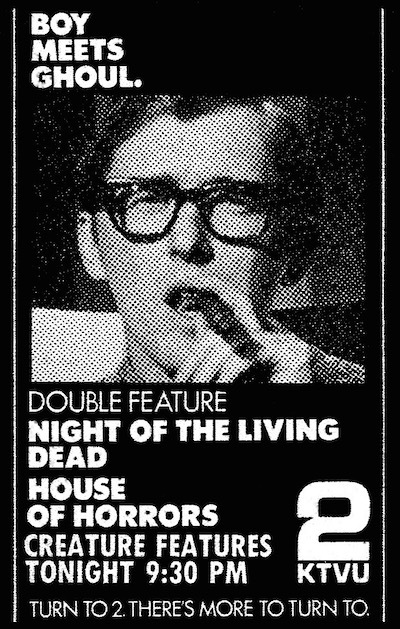 "Bob Wilkins is the Horror Host of the People!" 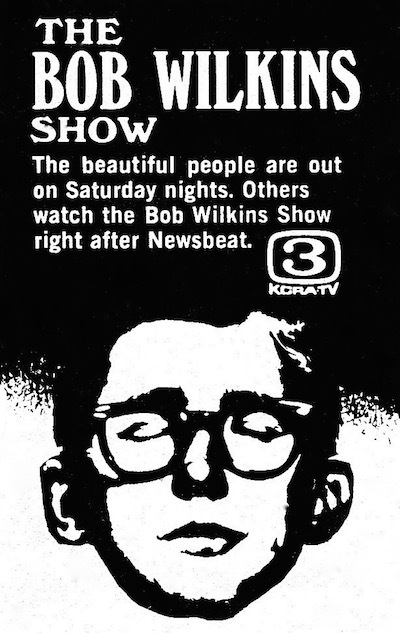 Full page TV Guide ad for Bob's move to KTXL-40 on May 9, 1970. The gloves are off in Warner Bros/Legendary's Official Press Release! 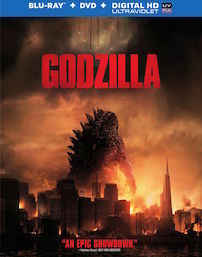 While there has been much fan speculation since Legendary Pictures King Kong franchise has moved over from Universal to Warner Bros, with the upcoming production of Jordan Vogt-Roberts' KONG: SKULL ISLAND, there surely would be a cross-over with their own GODZILLA franchise, which was launched with the 2014 Gareth Edwards film. And now, it has been officially announced in their upcoming schedule. KONG: SKULL ISLAND stars Tom Hiddleston, Sam Jackson, Brie Larson, John Goodman, Tian Jing, Corey Hawkins, Jason Mitchell, John Ortiz, Shea Whigham, and Toby Kebbell. Directed by Jordan Vogt-Roberts and written by Max Borenstein, John Gatins, Dan Gilroy, and Derek Connolly, KONG: SKULL ISLAND will fully immerse audiences in the mysterious and dangerous home of the king of the apes as a team of explorers ventures deep inside the treacherous, primordial island. Legendary’s Thomas Tull and Jon Jashni will produce with Mary Parent. Alex Garcia and Eric McLeod will executive produce. Warner Bros. will distribute the film in 3D and IMAX 3D on March 10, 2017. Personally, I like the Japanese originals, because they are Japanese. 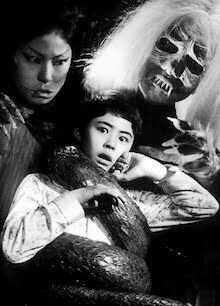 To me, these American incarnations are sidebars, as Toho's vampire films are treated by those into that genre. 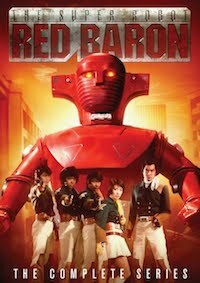 I hope that the fallout from these only gives the Japanese films more scope in the US, in the form of better treatments in releases of the originals on home video, and beyond. And, I also hope — at the very least — that these Hollywood-made incarnations are true to the spirit of the original characters, and will be fun, enjoyable escapism. Stay tuned for more details as they develop! 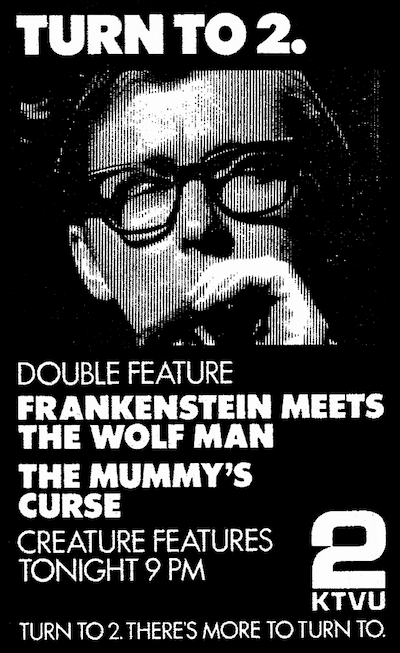 "The Secret Meeting is at Nine O'Clock..."
Half-page TV Guide ad for the November 10, 1973 double-feature. 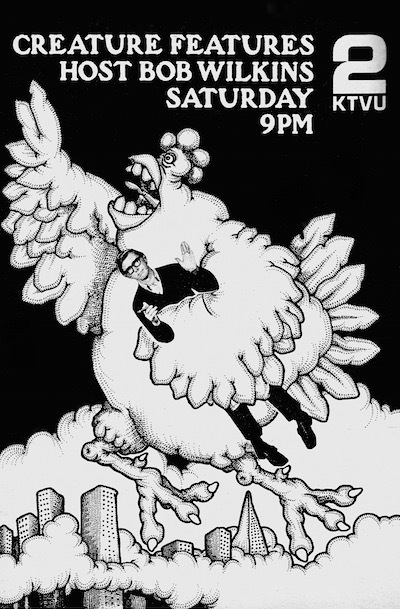 "Most Of Our Movies Are Turkeys, Anyhow..."
Full page Thanksgivings TV Guide ad from September 26, 1973. 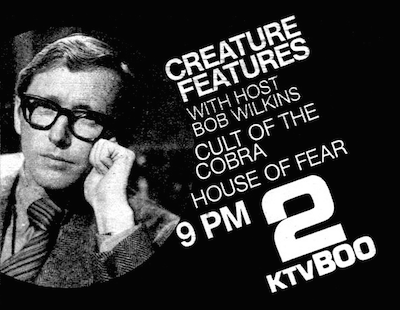 "The Strangest Thing About This Show on 2..."
Classic vertical publicity photo for "Creature Feautres" on KTVU-2. "Do You Wanna See Something Really Scary?" TV Guide, September 2, 1972. Bob became KTVU's Weather Man! 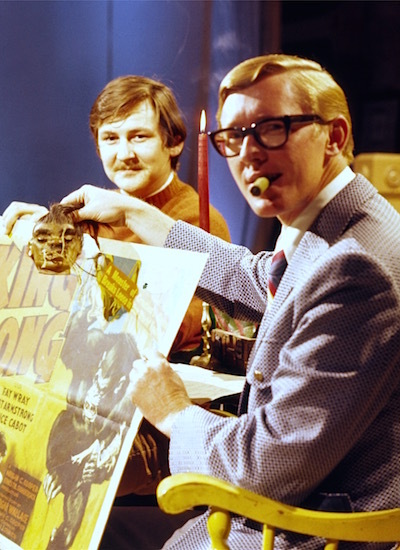 Due to his incredible popularity and massive ratings with "Creature Features", horror host Bob Wilkins was offered the job as the Weather Man for the all-new 10 O'clock News at KTVU. While the workload of doing this, and his horror shows at KTXL-40 in Sacramento and KTVU, eventually stepping down and going back to the fun horror. Even so, Bob garnered an Emmy Award nomination for his Ski Report, hilariously set to footage from the pre-credit sequence from Peter Hunt's Bond Adventure, On Her Majesty's Secret Service (1969). It was pure Bob at his wry best. 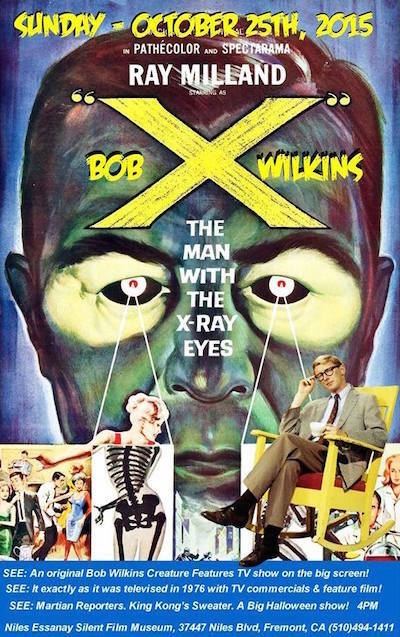 Promotional screenings were part of the Bob Wilkins experience! TITANIC TERRAPIN SET TO RETURN IN "GAMERA"! Director Announced, Trailer Screened at NYCC! 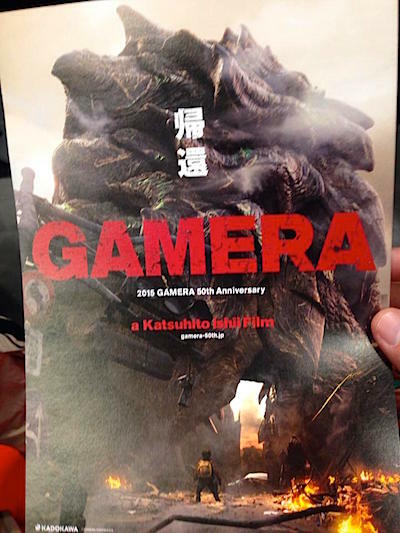 Advance promotional art for Kadokawa Daiei's upcoming GAMERA. Today, at the New York Comic-Con, Tsuyoshi Kikuchi, Senior Managing Director, and Shinichiro Inoue, Planning and Producer, from Kadokawa Daiei Studios traveled to Fun City to introduce their trailer — noted as a "pilot film" (read, "Proof of Concept") for this Golden Anniversary feature film, rebooting the studio's Gamera series, at this juncture, simply titled "Gamera". Their purpose was to unveil the trailer and announce the upcoming film to the world at one of the biggest pop culture and media events in the world. Kikuchi and Inoue (center) at NYCC. Photo by Edwin De La Cruz. 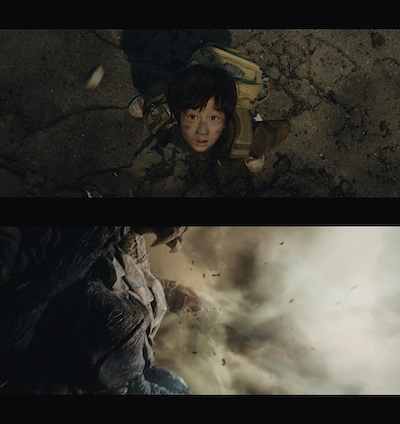 This trailer is also noteworthy in that all of the visual effects were created and rendered completely via CG, whereas the previous film, Ryuta Tasaki's GAMERA: THE BRAVE (2006), used traditional practical effects — miniature sets and man-in-suit monsters — with some CGI effects, primarily employed as a compositing tool. It appears that Daiei Kadokawa wishes to push the envelope even further to produce all of the visual effects in digital and leave the traditional behind. Director Ishii during the Yubari Int'l Fantastic Film Festival 2015. 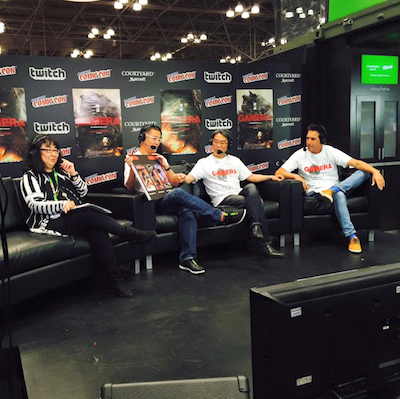 In all of the English-language publicity material handed out today at NYCC, including the live stage event — simulcast by Twitch — the director was announced as Katsuhito Ishii. 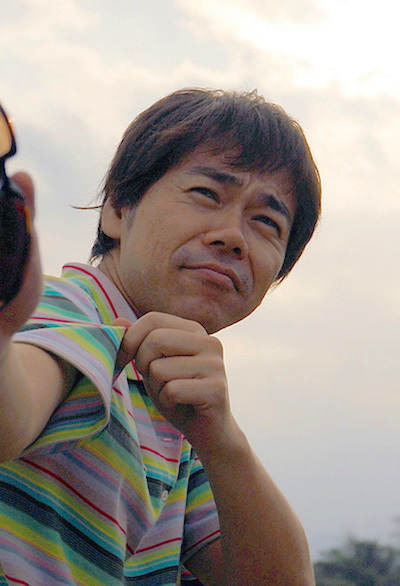 While the internationally-known director, who made his feature debut with SHARK SKIN MAN AND PEACH HIP GIRL (1999), has never worked in the genre before, he has considerable chops, garnered a number of awards, and worked with powerhouse actors such as Tadanobu Asano. Frames from the "pilot film" trailer, Gyaos Attacks! Enter Gamera! After the success of PARTY 7 (2000), Ishii was tapped to supervise the animated O-Ren flashback sequence by Quentin Tarantino for KILL BILL VOL. 1 (2003), and in the following year, scored another hit with THE TASTE OF TEA (winning "Best Feature" at the Hawaii Int'l Film Festival). In 2006, he co-directed the lauded FUNKY FOREST (2006) with his old school chums, Shunichiro Miki and Hajime Ishimine (aka Aniki), and formed the production company, Nice Rainbow. 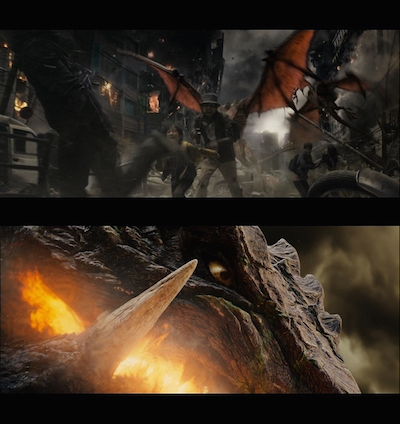 Frames from the "pilot film" trailer, Manafu rescued by Gamera! 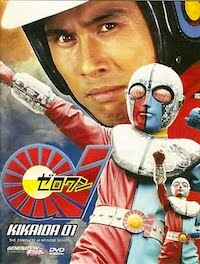 Ishii was cast in small part by director Hideaki Anno for the beguiling 2003 live action film, CUTEY HONEY (of course, Anno is coincidentally directing the next Japanese-made Big G film, Shin Godzilla), and also voiced the titular character Hal in the 2007 animated series HAL & BONS. Extensively working in animation, he penned the screenplay for RED LINE (2010) and served as Creative Advisor on LUPIN III: JIGEN'S GRAVESTONE (2014) for director Takeshi Koike. 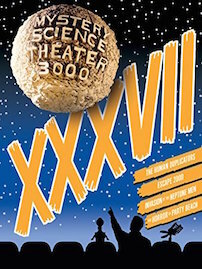 2-sided handbills distributed at NYCC. Photo courtesy of Mike Russo. 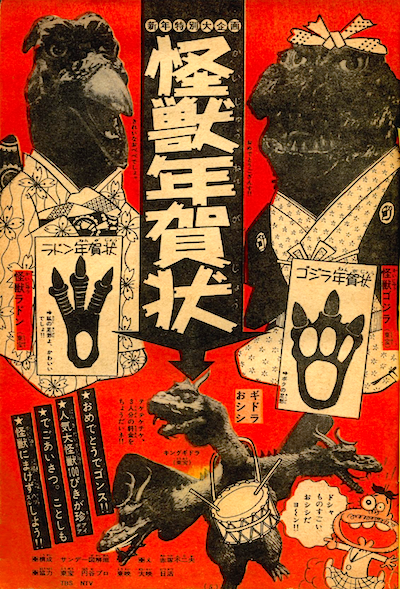 According to the handbills distributed at NYCC today, featuring the kanji characters「帰還」(kikan or returns), the story of this all-new GAMERA is thus summed up (paraphrased for colloquial English): "In a near-future Tokyo, giant monsters, known as 'kaiju', are thriving and terrorizing the populace. 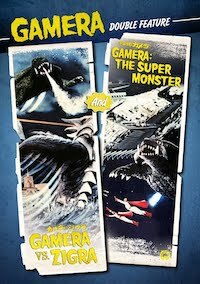 Manafu, a young boy, whose father is killed when the Gyaos strike the metropolis, is the only one who is saved by Gamera. What will Manafu's destiny be...?" Writer-Actor-Musician, Kankuro Kudo, plays Manafu's doomed father. 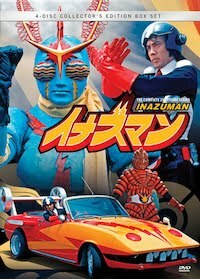 Appearing in the trailer as Manafu is seven year-old child actor Rui Takahashi, who has worked steadily since 2013 in ten commercials, fifteen television shows, and five feature films under his young belt, so far. His father was played by Japanese Academy Award-winning writer/director/actor/musician, Kankuro Kudo. 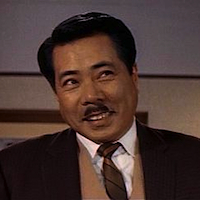 Among Kudo's lengthy credits are screenplays for GO (2001), PING PONG (2002), ZEBRAMAN 2 (2010), and he was recently cast in PIECE OF CAKE (2015). 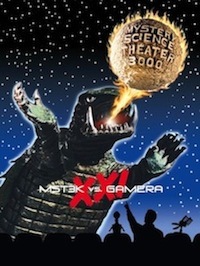 The official "Gamera 50th" website launched in tandem with NYCC. 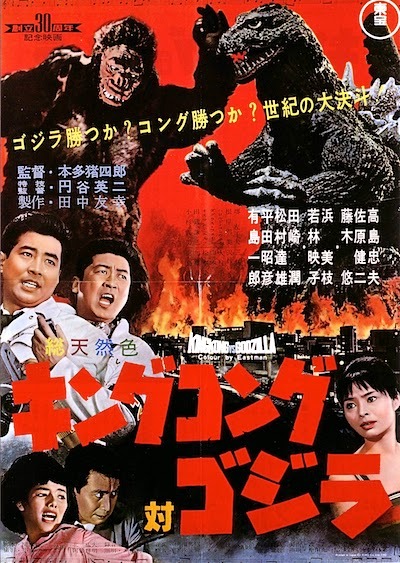 While kaiju fans across the globe will be waiting to see what the next move by Kadokawa Daiei Studios in the production of the upcoming film will be (release date was not announced), they're hosting a 50th Anniversary event at the Tokyo International Film Festival on October 22nd. 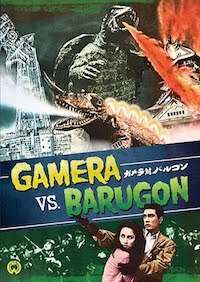 The longer proof-of-concept trailer will be run with a digital restoration of GAMERA VS. GYAOS (1967), as well as new 4K Scans of Shusuke Kaneko's Gamera Trilogy of the 1990s. 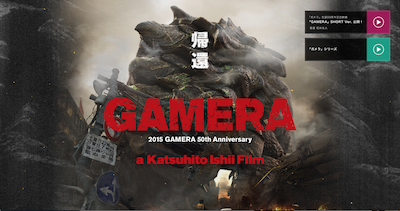 Stay tuned to this blog for further information on Katsuhito Ishii's GAMERA as production readies and more details develop! 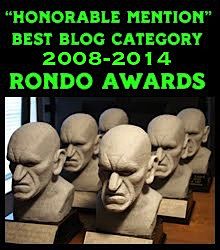 Also, check out my previous stories, here, and here. "They're Dead... They're All Messed Up." 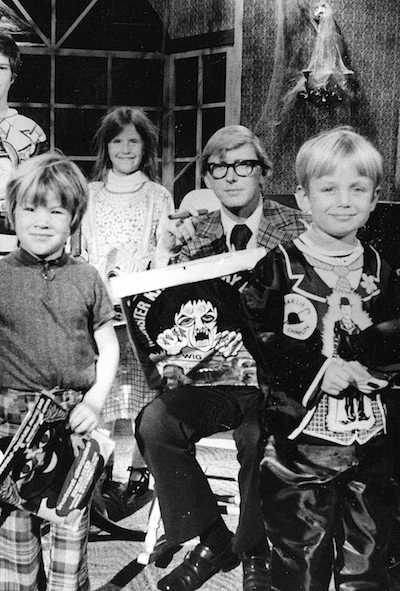 San Francisco television premiere of NOTLD on January 1, 1972. 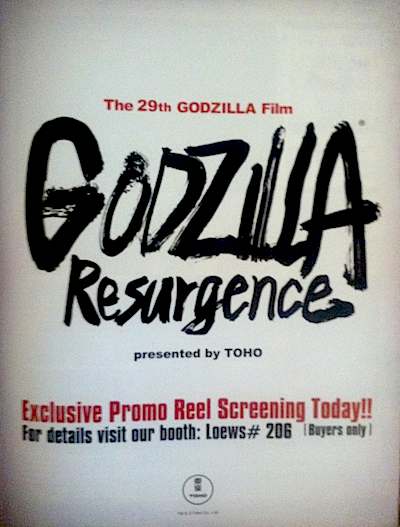 "NEW GAMERA" WILL BE REVEALED AT NYCC '15! 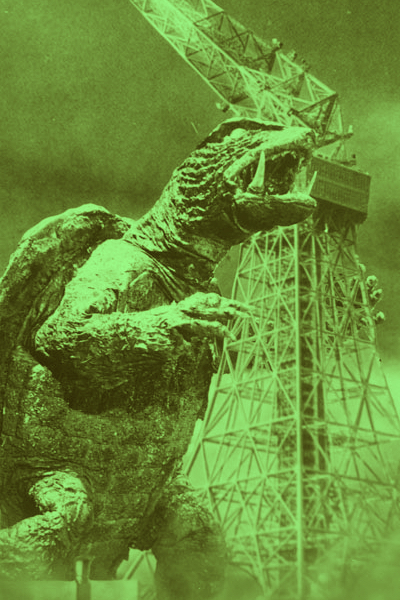 Gamera's getting off his back and going to New York Comic-Con. 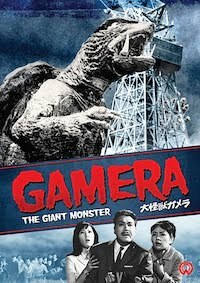 Everyone has been awaiting a new Gamera film for the half-century Anniversary, and Kadokawa Daiei Studios Co., Ltd. (which owns the entirety of the Daiei Studios and their catalogue, including Gamera) was prepping a big announcement last May for a release in 2015 — which I covered, here — but never materialized. 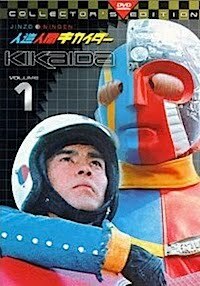 Most non-Japanese fans wondered why, not knowing the megalithic Kadokawa Group (the biggest publisher and film producer in Japan) was going through a series of major upheavals. On June 22, 2013, nine subsidiary companies in the Kadokawa Group were merged (eight of them now operating as branding companies) and rechristened Kadokawa Corporation, while Kadokawa Productions was subsequently dissolved and integrated into their intellectual properties business headquarters. The restructuring continued when Kadokawa merged with Dwango, which owns Niconico (the Japanese version of YouTube), forming a new holding company, Kadokawa Dwango on May 14, 2014. 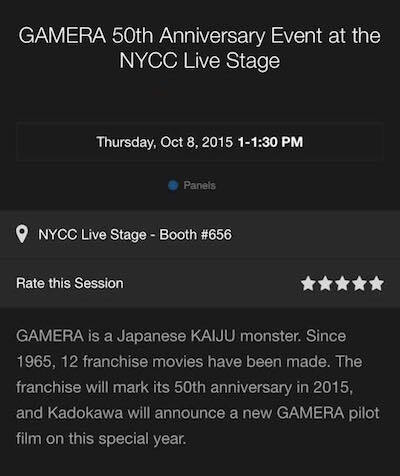 New York Comic-Con's listing for Kadokawa's Gamera presentation. Now that the dust has settled, the plan to celebrate the colossal chelonian's 50th Anniversary is moving forward. Tomorrow, reps from Kadokawa Daiei will be hosting a half-hour presentation on the NYCC Live Stage (Booth #656) at the New York Comic-Con to announce a new "pilot film". 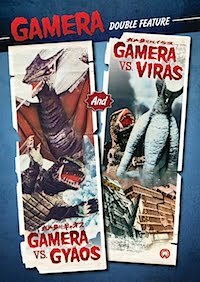 What that intimates is a test film or a teaser for a full-blown feature film, that obviously, will not be ready in time for Gamera's official anniversary this year (the original film was released on November 27, 1965). Sponsored by Shout! 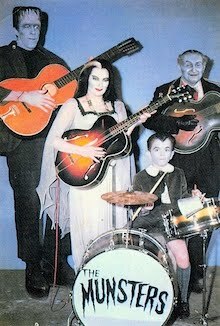 Factory and Famous Monsters of Filmland! 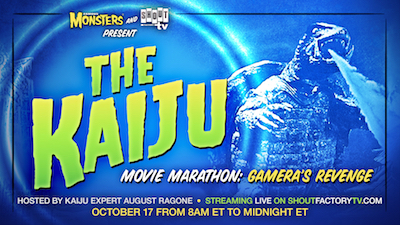 Meanwhile, don't forget I'll be hosting another "Kaiju Marathon" for Shout! 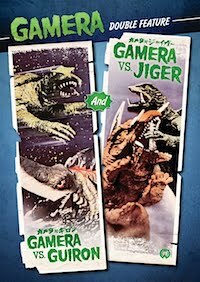 Factory TV on October 17th — this time, we're presenting "Gamera's Revenge"! 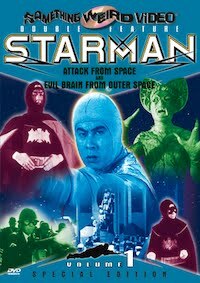 — streaming eleven of the terrible terrapin's feature films all day, absolutely free, starting at 8:00 am Eastern (stay tuned for more information)! "The Beautiful People... The Beautiful People." 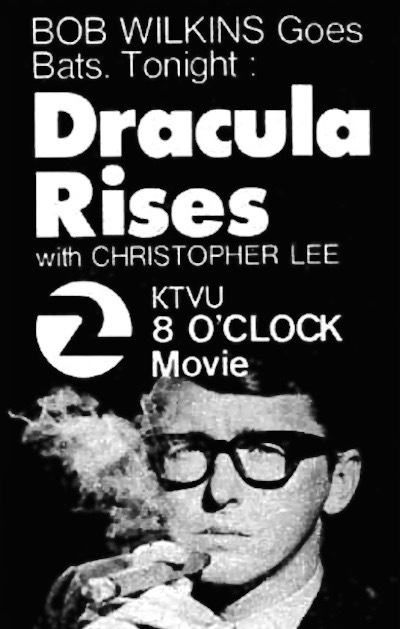 TV Guide ad for "The Black Castle", November 30, 1968 at 11:30 pm. "A Free Shrunken Head With Every Purchase!" 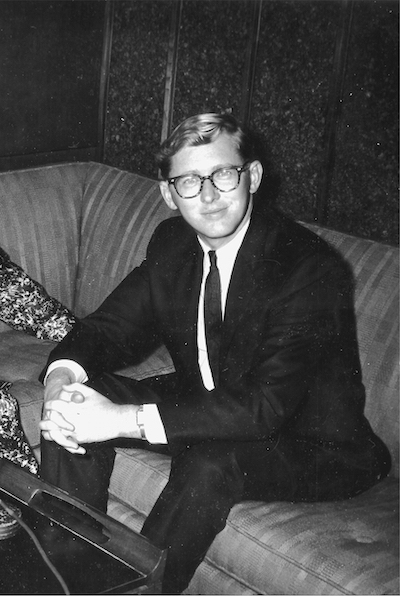 Bob with Dan Ferris, proprietor of the Cinema Shop, KTVU-2, 1971. 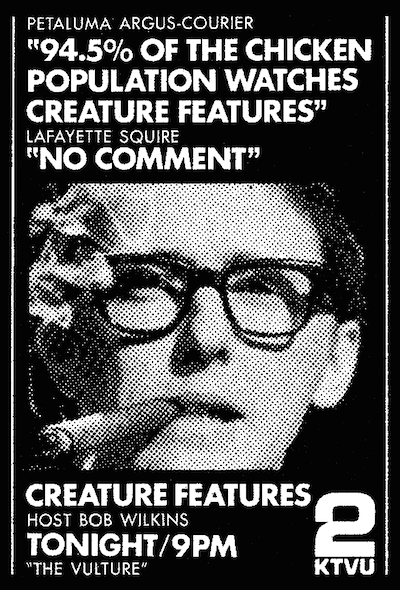 "Well, I Guess They Can't All Be Winners..."
TV Guide ad for "Creature Features" broadcast, May 29, 1971. "Bob Isn't Just for Saturday Nights Anymore!" 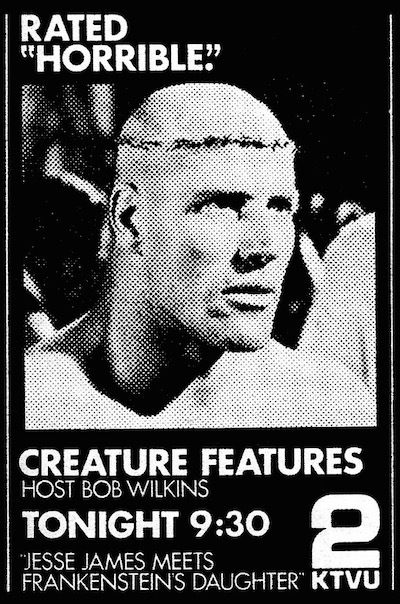 TV Guide ad for non-"Creature Features" broadcast, mid-1970s.